It's hard to know what Alvin Cassell would think, were he alive today, of the eponymous burger joint he opened in 1948. Cassell, who died this past June at the age of 98, was a legendary perfectionist, constantly seeking burger nirvana. Burgers weren't simply his business or even his abiding passion, they were his life's work. Click here for the map of 30 Burgers in 30 Days. Long before organic, free-range meat became a trend, Cassell had fresh, USDA-select beef flown in every day from Colorado. The meat was ground daily in a Hobart grinder. There were no leftovers; he sent those home with the hungry students who worked his counter. Displeased with conventional ovens, Cassell created his own oven griddle/broiler combo that fried burgers from below while broiling them from above. He mixed his own pungent Roquefort dressing (not to be confused with blue cheese), and eventually began making his own mayo. Then there's the house-made potato salad, spiked with horseradish and something sweet -- could it be pickle juice? According to a 1972 story from gentleman's mag Oui that still hangs on the wall, Cassell was so devoted to perfection he refused to serve French fries because he could not control their quality. The restaurant doesn't look like much, a lunch counter-style service area and aging Formica tables, but make no mistake, this was a temple to the humble burger. 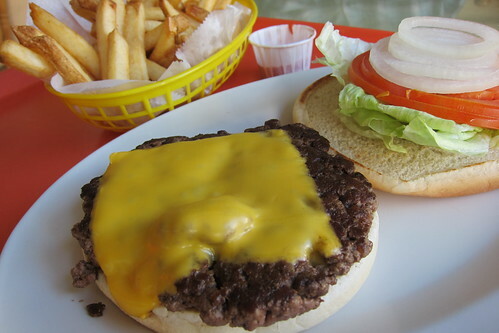 Magazines routinely dubbed it the best burger in the city. Generations of Angelenos agreed. These days, the place coasts mostly on nostalgia. The burgers are still pretty good, but we suspect Cassell would wince at the rubbery pastrami, the meh fries, the garden burgers on the menu. Meat & Bun: Cassell's was never about fuss. This is the home of the Spartan burger, broiled to whatever degree you like, and served naked on nothing more than an upgraded version of the classic white bread hamburger bun. The meat tastes very clean, not aggressively seasoned or gamey as is the trend with many upscale burgers these days. The burgers are large and flat, the size of a small Frisbee if you pick the 1/3-pounder ($6.75) and nearly the size of a full Frisbee if you get the 2/3-pounder ($7.95). Toppings: You want cheese? You can choose between American or Swiss for an extra $0.25. The serve-yourself condiment bar offers ketchup, mustard, mayo, iceberg lettuce, tomatoes, raw white onions and the aforementioned Roquefort, a sharp peppery sauce that may overwhelm a burger but makes an excellent dipping sauce. Sides: The fries, which still have some of the brown potato skin, are thick, lightly crisped on the outside and mealy on the inside. Respectable though unmemorable. Cassell's big secret may be the fried zucchini, essentially an entire zucchini that's been quartered and coated in a rosemary-tinged batter. 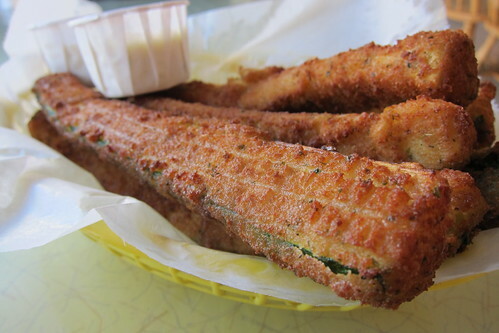 Served fresh from the fryer, it's among the best fried zucchini we've ever had. Dessert: Forget about it. The condiment bar includes cottage cheese and canned pineapple, but they look as unappealing as most 1980s diet fads. There's house-made lemonade, though it's got so little lemon flavor, if it wasn't for the name, we'd be hard pressed to describe it as anything other than sugar water. The Upshot: Stick to the basics and enjoy the nostalgia. Get a burger, load up on potato salad and don't forget the zucchini fries, preferably dipped in the house-made Roquefort. CASH ONLY.